Stats say that every human living in an industrial nation uses about 20,000 kg paper in his life. Paper may be impregnated, enamelled, metallised, made to look like parchment, creped, water-proofed, waxed, glazed, sensitized, bent, turned, folded, twisted, crumpled, cut, torn, dissolved, macerated, moulded, and embossed. It may be coloured, coated, printed or even written on! It can be laminated with fabric, plastic and metal. It can be opaque, translucent or transparent. It is naturally combustible, or can be made fre-retardent. It may be a carrier or a barrier or a filter. It may be made tough enough to withstand acid, or soft enough for a baby’s skin. It can be read and worn as a garment. It can be re-used and recycled and it is made from a renewable, sustainable source. The range of possible uses of paper seems almost limitless. New ways of using it are being devised daily. This evolution will continue because paper is an expression of everyday living. Wallpaper, damp-proof courses, roofing, flooring, flame resistant papers, plasterboard, and decorative laminates for furniture. Print out sheets, receipts, circulars, catalogues, filing systems, sales and service manuals, brochures, and letter heading. Fascia boards, door and roof liners, filters the Highway Code, and driving licences. Writing pads, envelopes, newspapers, magazines, greeting cards, calendars, diaries, telephone directories, labels, business and identity cards. Tissues, paper plates and cups, toilet paper, kitchen towels, table napkins, and lampshades. Special insulating boards, electrolytic condenser paper, wrapping and identification for electrical cables, printe( circuits, and battery separators. Menu cards, paper hats, crackers, fireworks, wrapping paper, programmes, playing cards, board games, kites, model aircraft, and race cards. Filters for water, air, coffee, medicine, beer, oil, and mechanical uses. Protection for manufactured goods, in transport, transfer sheets for decorating chinaware, display boards, point of sale materials and in storage. Wrapping to keep instruments and equipment sterile, bandages, first aid bands, clothing for nurses, face masks, surgeons’caps, disposable bed pans, sheets, and pillowcases. This is an amazing variety of applications but although there is a sophisticated recycling industry the usage of paper still destroys parts of our ecosystem. The paper consumption in individual countries is related to their gross national product. The further increase in paper and board consumption will be different in different countries depending on whether economic saturation, as e. g. in the United States, in the North European and some Central European countries, and also in Japan, or fast increasing demand, as in China, is prevailing. But also India, Russia and some other Asian and East European countries will come up in the near future with growth rates above the average. 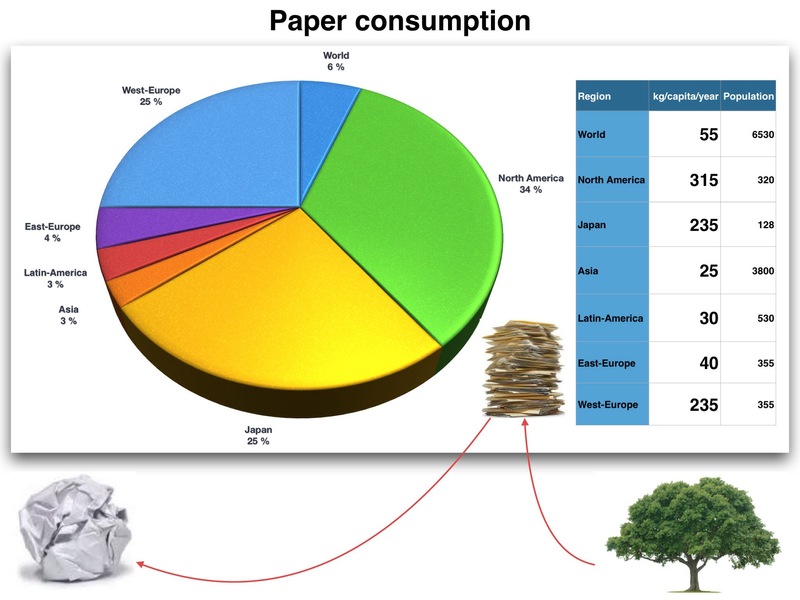 The following comparision between the paper consumption per capita and the population in the various regions of the world demonstrate the significant differences and devine the future development of the paper demand there. Worldwide consumption of paper has risen by 400% in the past 40 years leading to increase in deforestation, with 35% of harvested trees being used for paper manufacture. Logging of old growth forests accounts for less than 10% of wood pulp, but is one of the most controversial issues. Paper waste accounts for up to 40% of total waste produced in the United States each year, which adds up to 71.6 million tons of paper waste per year in the United States alone. If you plan to go paperless you won’t change the stats significantly but there are some other benefits when moving from ring folders to flash memories. Scanning documents is a daily task for big businesses but it also can be useful for private purposes. You have access to all important information without taking heavy filing folders with you, search within documents without looking through countless pages, send documents or parts of them to companies or authorities, etc. instead of copying them on new paper. Another benefit is that you still have the content even if original documents get lost for what reason soever. After buying an iPad about one year ago I started to reduce paper consumption. The first step is to find out the right apps and then optimize the workflow from incoming or already existing documents to permanent storage on an iOS device. There are three apps available at Apple’s App Store which meet all these requirements. with an impressive user interface for scanning by using the integrated camera. 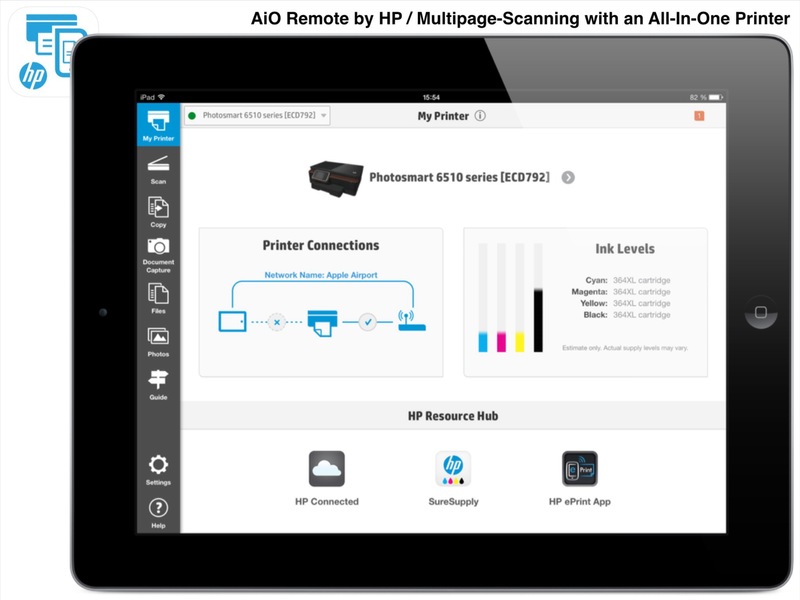 for hardware-based scanning in connection with an AirPrint capable Three-In-One (Print, Scan, Copy) device by Hewlett Packard. for extracting text from photos and saving the content as PDF. This is a much more faster procedure than scanning documents with an AiO device although the quality is slightly reduced. as a tool to access nearly all cloud storages as well as local computers running on OS X or Windows with powerful features like moving multiple files from one storage to another, zipping files, etc. It was a rocky road to find out these apps in Apple’s App Store with thousands of productivity apps. The developers of the mentioned products did their homework in the last months and today the apps are quite powerful. As you can see this suggested solution is not based on a database system. I will discuss the alternate way to go paperless in my next post. Documents supports Box, Dropbox, Google Drive, SugarSync, SkyDrive, Office 365 Sharepoint, CloudMe, WebDAV, Windows SMB, FTP Server, and SFTP Server (as of Dec 2013). 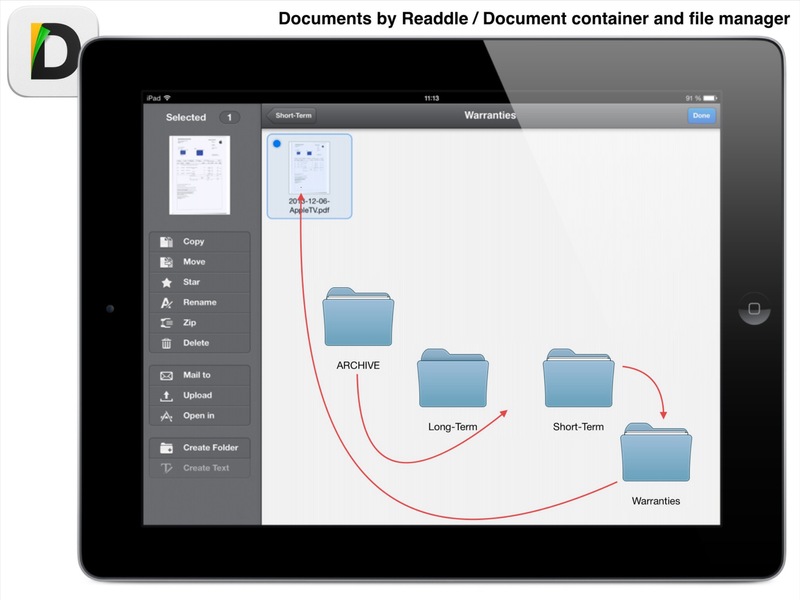 For a full feature description of Documents by Readdle see my post mentioned under ‘Related links’. AiO Remote supports, iCloud (for syncing), Box, Dropbox, Google Drive, Evernote, and any WebDAV access, e.g. iDriveSync. 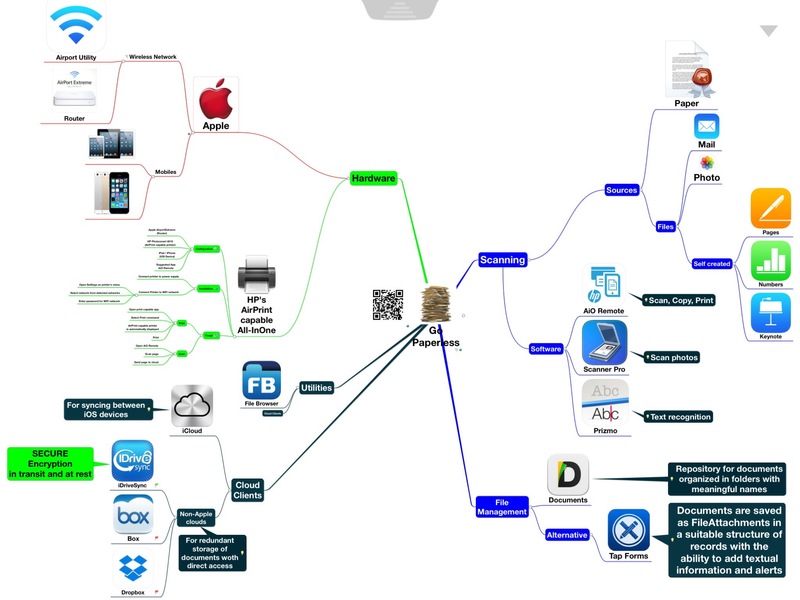 Scanner Pro supports Apple’s iCloud so that documents e.g. 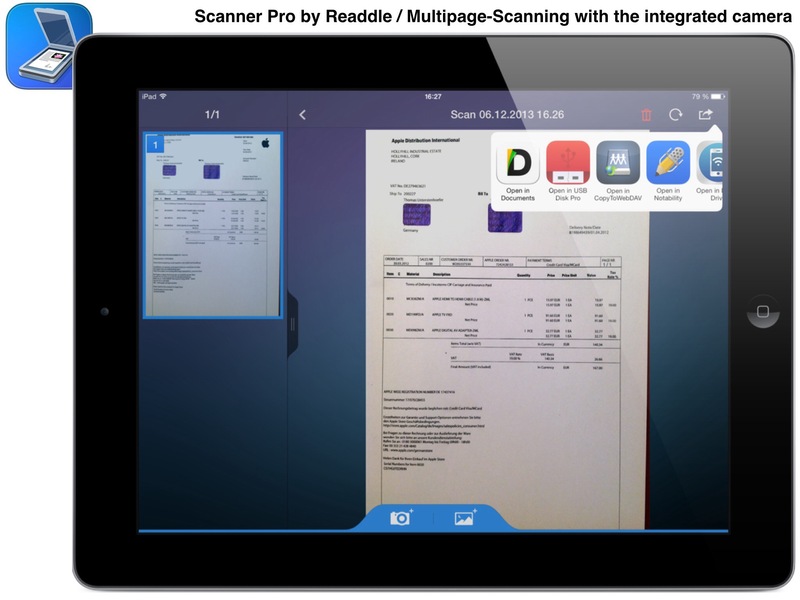 scanned with an iPhone are automatically also available on an iPad. Many of the scanned documents contain information which must be available over years. So it’s indispensable to use a suitable file format which allows access over a long time and it turns out that it’s the PDF file format of Adobe. Additionally it’s worth thinking about the folder structure where scanned documents should be saved. I always use structured file names containing a date (e.g. conclusion of a contract) and an added short description pointing to the main content, for example 2013-12-06-AppleTV or 2014-01-13-CarLeasing. An essential point is that there are at least two different storages so that access is still possible even if a device is broken, replaced, or not in use. It needs some efforts to replace old documents by newer ones and to delete documents which are not valid any longer. But this is a task you also have to do when using ring binders. Nothing is more annoying than to find invalid information when searching for essentials. Check the legislation in your country. Paperless storage of certain documents without keeping the originals might be inoperative. In this case the old-fashioned usage of ring binders is still indispensable. This was the case in Germany where companies sent their invoices as PDFs which were inoperative if the company didn’t digitally signed them. Legislation was changed because it hampered the workflow of small enterprises. It’s up to where you primarily store your documents. Keep in mind that everything is stored in Apple’s iCloud if you device is backed up to iCloud. So if you don’t want your documents saved in iCloud you should turn off iCloud backup. If you use a cloud provider it is indispensable to read the terms and conditions. Free cloud storages are subject to change and suspension without notification. See ‘Risky free clouds’ under ‘Related links’. A suggested provider is iDriveSync with encryption of data in transit (during transfer from your device via internet) and at rest (when saved on a provider’s server). If your goal in maintaining a paperless office is greater productivity, you may find it more useful to focus on that, rather than on the paper itself. For example, if you receive lots of printed documents and your main problems are finding information in them and figuring out where to file them, the scan-OCR-shred routine will serve you well. It won’t literally reduce the amount of paper you encounter, but it will address the inconveniences you struggle with. Then there are the trees. Environmental issues, including saving forests and reducing waste, are certainly noble reasons to decrease paper usage. Please do not print this page, just save the PDF version.